One of the most baffling things to me about GamerGate and the general discussion of the future of videogames is the issue of gender. I’m fundamentally unable to comprehend the mind of someone who feels threatened, on an instinctual and gut level, with women coming in to “his” space of video games. I’m fundamentally unable to empathize with someone who worries about whether or not games will continue to represent him, or speak to his needs and interests. And it was so shocking to me the first time I realized that was a concern, that I was literally dumbfounded for a time. I don’t write that to buff up my Social Justice Warrior credentials, or because I want to appear as some sort of perfect enlightened being. I am not perfect, and I maintain I’m more of a Social Justice multiclass (Rogue/Bard maybe) because I have an odd selection of skills. No, I say this because my initiation in to the Cult of Game was through a woman, and so I’ve always seen Video Games as wholly appropriate for women. Most people come to video games, I imagine, through a person. You can like video games from abstract descriptions, but I feel like most people I know experienced a love of video games first through someone else—and for many people in video game history it seems like those people were male. An older brother, an uncle, a best friend, maybe even a father—it was some male friend or family member transmitting the Sacred Mario to another; 16-Bit Freemasonry. But for me, it was my Mother. I don’t remember which game was my first, but as long as I can remember she played them. My teeth were cut early on Dragon Quest. When Mom would get tired of endless grinding for levels—not that we called it grinding then—I would get to play, and help her. Her main character, after I was born, would always have the same name: Mom. I helped Mom adventure in multiple Dragons Quest (it’s pluralized like Attorneys General, right? ), and many others. The hero always won, the bad guys (and approximately 470 billion evil slimes) were always vanquished, and the hero was always named Mom. The one I remember most clearly is when I was six. I must have been in kindergarten, because I was at the Denver Jewish Community Center. Dad was out of town, so we were just with Mom. She picked us up early from the after-school care, my brother and I, which we knew was odd—it meant she had left work early too. We didn’t know why until she told us as we walked out: She had bought the new Legend of Zelda game, a Link to the Past. We went home and that is all I remember doing, playing that game. I have no memories of eating, sleeping, or doing anything besides playing as Link—and by Link, I mean Mom. We watched her for hours as she started in to the rain to rescue her Uncle, and the Princess Zelda. We had played the other games, but this was the first time that I remember being gripped by the story. We helped her with puzzles and bosses, and sometimes played her file without saving when she wasn’t looking. I fell in love with a Princess named Zelda, and a boy named Link who was really named Mom—and I’ve never stopped playing them. Next year when the new game comes out I will own it, and a Wii U to go with it. When I moved to Thailand in 2009, I got a text from my Mom. I typed it up and saved it on my computer, because it was so sweet—and reminded me of family, when I was very far away. It said she loved me, and missed me, and that she was sorry we hadn’t played more Zelda (Twilight Princess) that summer before I left. That’s how important it was to us—18 years later, we had been doing the same thing with Twilight Princess we did with A Link to the Past. In the years in-between Mom stopped being able to play a lot of console games, due to motion sickness issues, but found another way to play: World of Warcraft. She, my step-father, and my brothers all play in a guild and raid together, in addition to going back to play Legend of Zelda when a new game comes out. So that’s why it baffles me. People who are uncomfortable with women coming in to gaming more strongly ignore the fundamental point: Women have been playing video games all along. They want the same things you want: Good games, good stories, good controls, and good graphics. Making protagonists female, or people of color, doesn’t change any of those four things—and it doesn’t change the fact that they’ve been playing male characters for years without feeling icky or wrong. So can we all please remember that the controllers aren’t run by genitalia, that the ability to sympathize and empathize with the journey of someone different from you is called being human, and that sharing games with other people isn’t just fun—it’s how most of us got in to video games? And if we can’t remember all that, then at least remember this: If you play on WoW, there is a chance the person ahead of you in DPS isn’t just somebody’s mother—she’s mine. This post is dedicated to my mother. 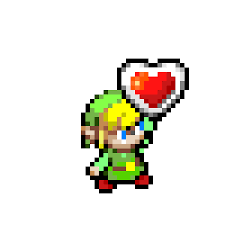 Happy Mother’s Day (I know this is late, I did call and send her something—a Link holding a heart I bought at a convention, like the picture above). This entry was posted in Rants, Video Games.